UIGradient is now available on CocoaPods. Simply add the following to your project Podfile, and you'll be good to go. static func fromGradient(_ gradient: GradientLayer, frame: CGRect, cornerRadius: CGFloat = 0) -> UIColor? static func fromGradientWithDirection(_ direction: GradientDirection, frame: CGRect, colors: [UIColor], cornerRadius: CGFloat = 0, locations: [Double]? = nil) -> UIColor? static func fromGradient(_ gradient: GradientLayer, frame: CGRect, cornerRadius: CGFloat = 0) -> UIImage? static func fromGradientWithDirection(_ direction: GradientDirection, frame: CGRect, colors: [UIColor], cornerRadius: CGFloat = 0, locations: [Double]? = nil) -> UIImage? 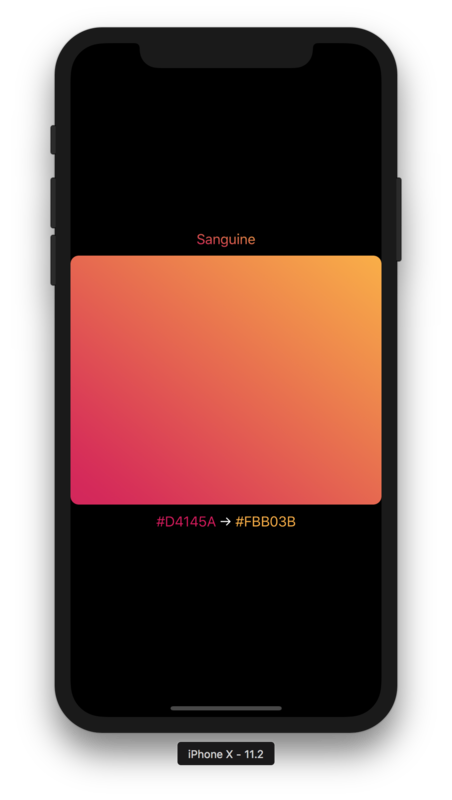 UIGradient was inspired by @lukedesigner. I created 24 gradients based on his website and make them static variables of GradientLayer so everyone can use those gradients for their projects. You can explore them in my example project. UIGradient was created by Đinh Quang Hiếu (dqhieu13@gmail.com) in 2017 using Swift. If you found any problem please create issue or pull request to help me improve this open source project. Thanks! UIGradient is released and distributed under the terms and conditions of the MIT license.